Allergen Information: Contains Wheat, Gluten, Soy, Soy Bean, Egg. 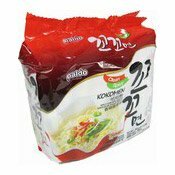 Ingredients: Noodles: Wheat Flour, Palm Oil, Modified Potato Starch, Potato Starch, Vegetable Seasoning, Gluten, Emulsified Oil, Salt, Alkaline Agent, Guar Gum, Calcium Powder, Onion Extract. Soup Base: Chicken Broth, Sugar, Salt, Artificial Chicken Stock Powder, Flavour Enhancer, Corn Starch, Soy Sauce Powder, Green Onion Extract Powder, Red Pepper Powder, Soybean Oil, Artificial Chicken Flavour, Black Pepper Powder. Flake Soup: Green Onion Flake, Egg Flake, Chicken Breast, Pepper Flake.